MATHSprint. It makes Maths questions. Fast. If there's a more cost-effective, versatile and generally darn brilliant generator of maths questions and solutions out there, we'd like to know. 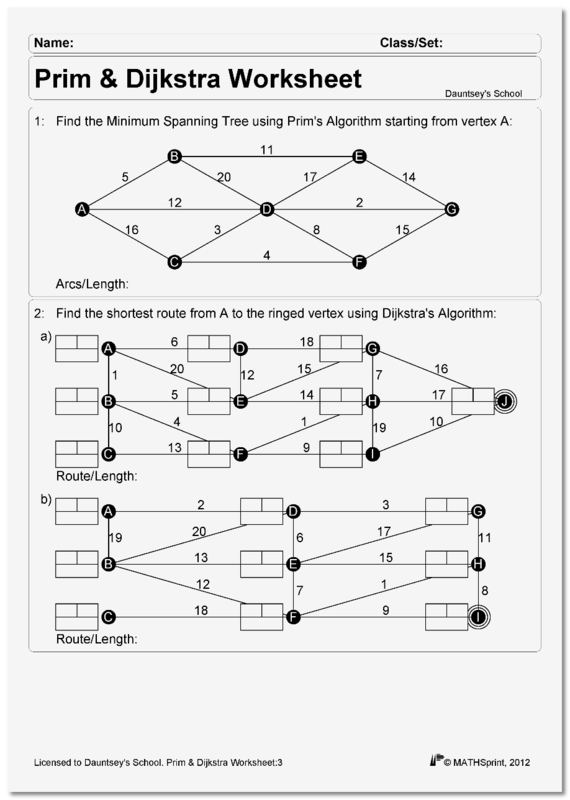 MATHSprint makes it simple to produce unlimited high-quality, tailor-made maths worksheets and tests in an instant. It is an indispensable time-saving tool for anyone involved in Mathematics education. Now available for tutors and parents, too! Teachers and students at over 400 schools across the UK and abroad are already benefiting from MATHSprint, which now covers most topics in the 2015 GCSE Maths specification. Never run out of practice material for your students, thanks to an inexhaustible supply of intelligently-randomised questions on over 1300 different topics – plus full solutions. Show questions on an interactive whiteboard and write on top for instant worked examples. 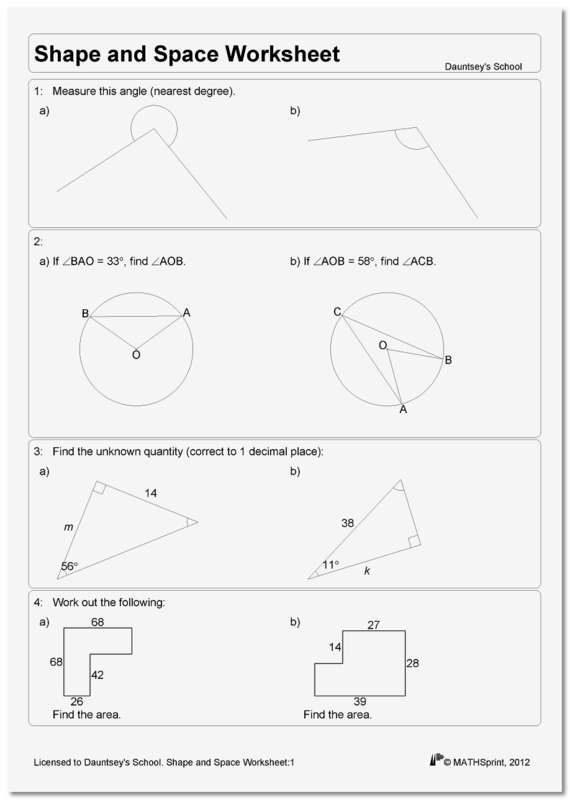 Create differentiated worksheets to reinforce new topics from pre-GCSE to AS Level. Publish questions and solutions on your VLE or Intranet, and email pdf worksheets to students who are not present in a lesson. UK software tailored to the UK curriculum. Works with Microsoft Windows XP onwards. Find out how MATHSprint can benefit you and your students. Rapidly generate questions on a vast range of topics ranging from pre-GCSE through GCSE, IGCSE and Add Maths to A-Level Discrete and Core modules. Quick and easy to use – just double-click the topics you want, select the number of parts per question and print. Produce unlimited variants of any worksheet in seconds (same topics, different questions). Save paper – pdf worksheets can be displayed on a whiteboard, published on your Intranet/VLE or emailed to students. Benefit from an inexhaustible supply of intelligently-randomised questions with a unique anti-repetition check. Generate solutions automatically for ease of marking, with steps in working shown where appropriate. Allow space for students to write answers on the worksheet itself or else condense the layout so they answer on separate paper. Select from many levels of differentiation within each topic area. 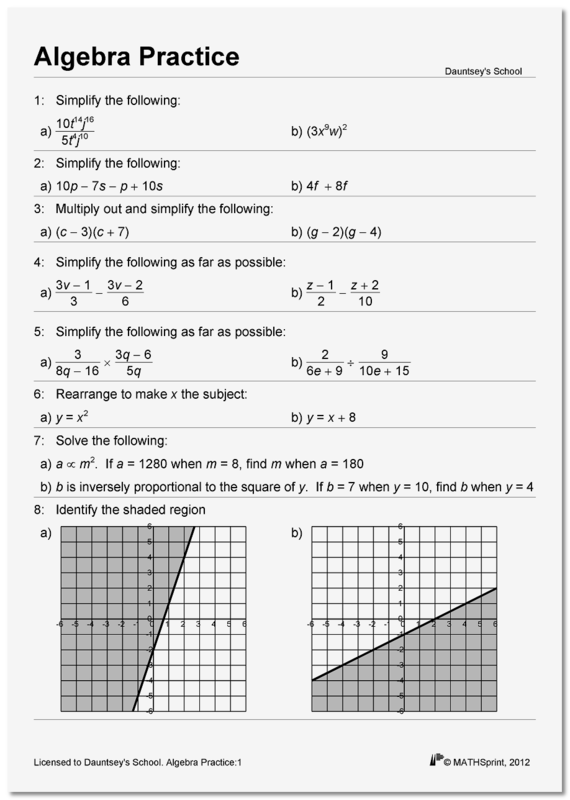 Compile any combination of topics whatsoever into one worksheet for personalised practice. Have full control of the font, font size and space provided for working. Choose from three smart layout options: Classic, Ruled and Boxed. (e.g. Trigonometry, Graphs, Histograms, Discrete). No need to file paper copies of worksheets and solutions – any sheet can be regenerated on demand. 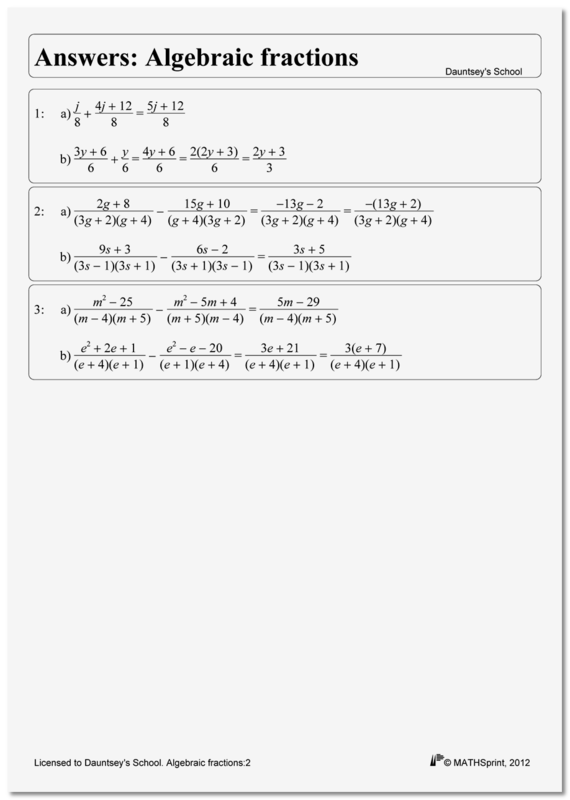 Use MATHSprint for worked examples, homework, classwork, revision, tests or even examinations. The Site Licence allows all staff in your department to use the software at home as well as at school. Written by a former research scientist and practising Mathematics teacher with 21 years' classroom experience. MATHSprint works with all versions of Microsoft Windows from XP onwards. No Internet access is required to use the software. Download a free demo version and free PDF sample sheets. MATHSprint top tips for the classroom. Create differentiated practice material as each new topic is introduced. Make end-of-topic tests; you can even vary the questions from year to year. Print customised revision sheets with any desired combination of topics. Publish questions and solutions on your VLE or Intranet. Provide personalised remediation worksheets for IEPs - target the questions to the needs of each student. Display questions on an interactive whiteboard and write on top for instant worked examples. Show practice questions (and answers) on the whiteboard - save paper and time! Email pdf worksheets to students who are not present in a lesson. Compile a paperless resource bank of worksheets - any sheet can be regenerated on demand as required. Use one worksheet for class practice and another (with identical topics but new questions) for homework. Give different sets of questions to pairs of students so that they discuss methods rather than copying answers. Rapidly produce relevant work for cover lessons when colleagues are absent. MATHSprint has been developed over the past ten years by Dr Tim Price, a former research scientist and a full-time Mathematics teacher with nineteen years' experience in the classroom. He found plenty of websites that would generate basic worksheets (times tables, fractions, simple algebra) but nothing that would cover the whole GCSE syllabus, let alone help with A Level topics. He therefore set out to create a more flexible and powerful maths worksheet generator (currently running to over 20,000 lines of code), testing it with his own classes at school to see what worked best and to iron out any problems. Soon the whole department was using it on a regular basis and making suggestions for further additions and improvements, and then word started to spread to other schools as well. Over 400 schools and tutors have purchased MATHSprint since its launch three years ago; have a look at the sample worksheets below and download the free demo version to see how quick and easy it is to use. 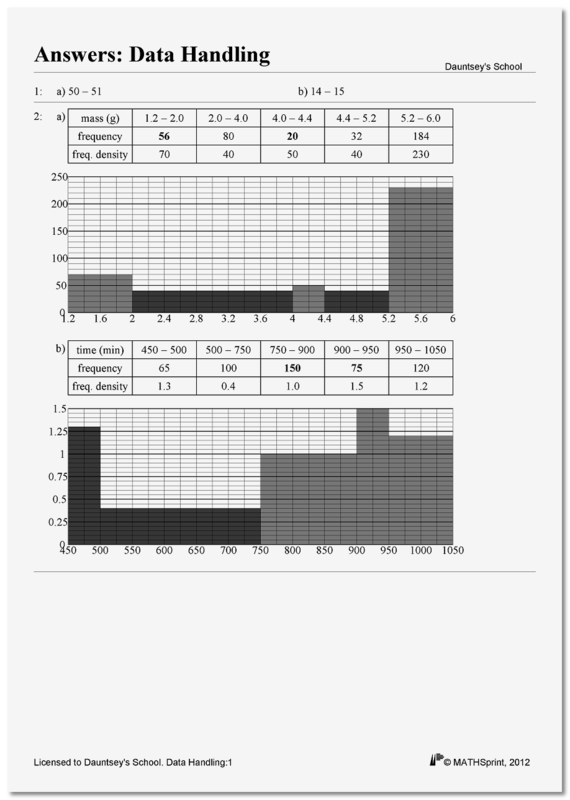 A Number worksheet using the Boxed layout and Times font. 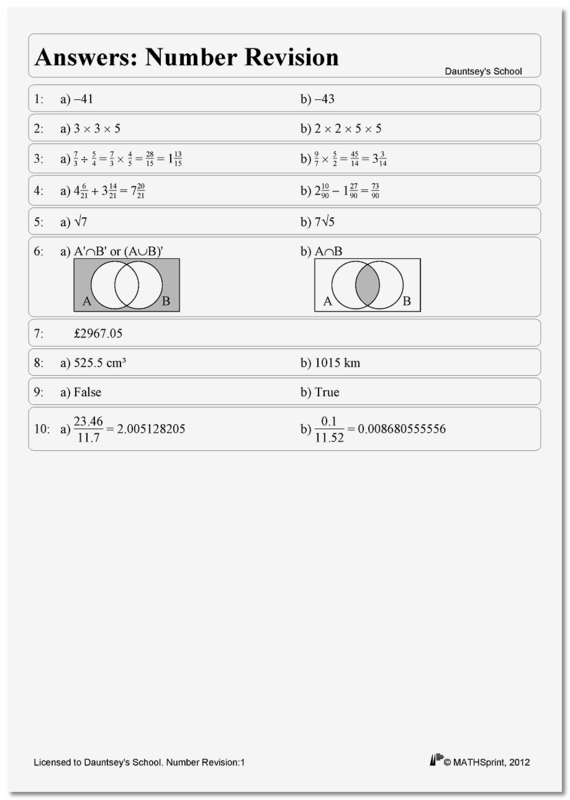 You can see that answers for fraction questions include steps in the working, while one question on Venn diagrams has two possible answers, both given. An Algebra sheet using the Ruled layout and Arial font. The proportion questions use a variety of wording, and the solutions for algebraic fractions include all the steps in the working. 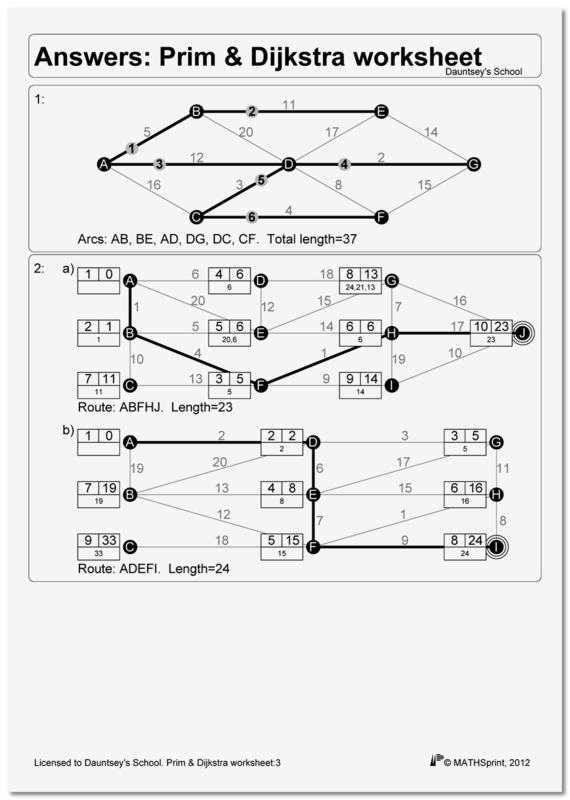 Although these questions have two parts, a) and b), you can select anywhere between 1 and 26 parts per question. Many A-level topics are also covered. Students can show their working and write their answers on this Discrete worksheet. There is plenty of space on this Algebraic Fractions sheet for students to write their working. You can easily increase or decrease the amount of space provided. This Shape and Space worksheet demonstrates the range of graphics that MATHSprint can generate. Questions on the same topic area are suitably varied as to layout and solution method. 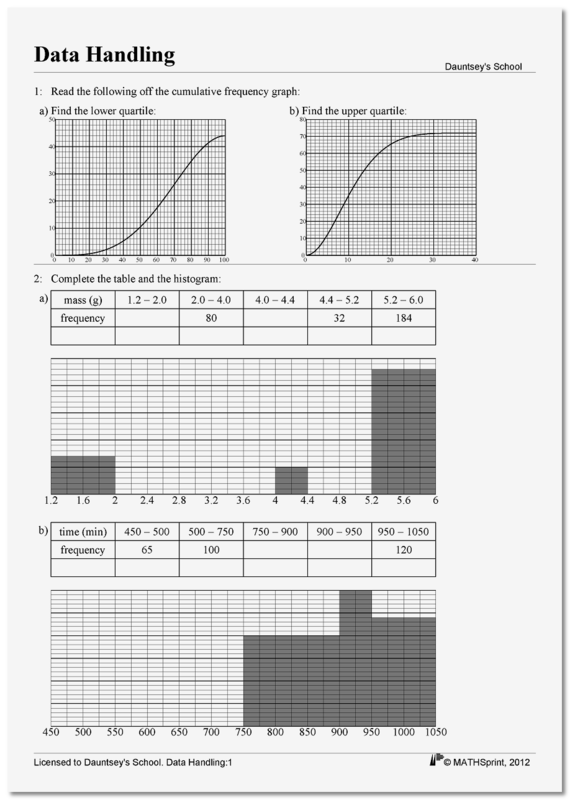 At last, an endless supply of Cumulative Frequency and Histogram questions!